As some of you may know, I recently became a certified scuba diver to prepare for my 2013 trip to the Maldives. Less than a year later, I’ve become a full-fledged diving addict with dives in Grand Cayman, Australia, Brazil and various other spots under my “weight” belt. And I have many more to tackle on my bucket list. Lately, readers have asked for great snorkel destinations, and I realized that in in my scuba diving-obsessed haze, I’d all but forgotten that many times great dive spots can also make for excellent snorkeling destinations. All you need is a clear, shallow stretch of water that attracts plenty of marine species. For all you snorkeling enthusiasts out there (or many-a-newbie just itching to try it for the first time), here are my picks for some of the most fascinating snorkel spots in the world. I tried to include a little something here for everyone: beginner and advanced snorkelers, families, exotic locales and a few destinations closer to home. Obviously, there are a number of incredible snorkeling spots in the world, and we couldn’t include them all. If you have any favorites, be sure to add them in the comments section below! 1. Plaza Sur, Galapagos Islands. Located on the northeastern coast of Santa Cruz, Plaza Sur is a tiny island of just 32 acres. It’s fairly loaded with wildlife, both above ground and underwater. 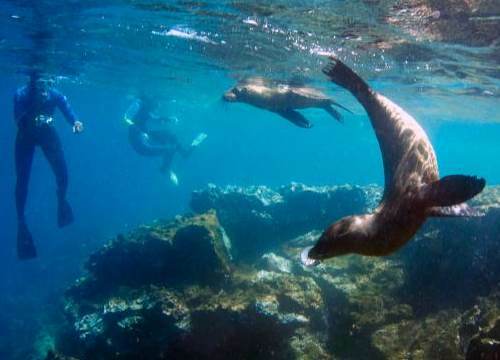 This bite-sized paradise is one of the world’s best spots to see sea lions. Relatively unfazed by humans, the pinnipeds will swim right up to you. Another potential sighting is the marine iguana who you might find slowly climbing in and out of the water to sunbathe on the rocky shore. When you come up for air, check out the the wide variety of seabirds here, such as the rare Galapagos hawk. 2. Lord Howe Island, Australia. Home to the southernmost coral reef in the world, and one of the best-preserved reef systems on Earth, Lord Howe Island stays in pristine condition by only allowing 400 tourists to visit each day. This island is special because it offers an opportunity to view a vast variety of underwater creatures as you swim past trenches, caves and volcanic walls. 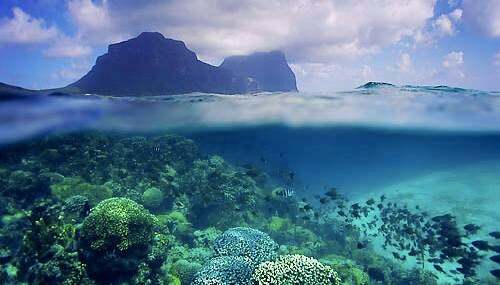 Lord Howe Island boasts over 500 fish and 90 coral species. You can expect to see rare specimens like Spanish dancers, Galapagos whalers, yellowtail kingfish, bluefish and ballina angelfish. There are several great snorkeling zones here, most of which are accessible by a quick boat ride from the shore of this magical island. 3. Key Largo, Florida. If you don’t have the time or the funds for an exotic trip to the Southern Hemisphere, you can get your snorkel on a bit closer to home in Key Largo, Florida, home to the only living coral reef in the continental United States and the third largest in the world. The island is just an hour and a half drive from most South Florida airports, making it convenient for a long weekend snorkel getaway or even a day trip from Miami. This rare spot’s history of marine conservation dates back to 1960 with the creation of the first undersea preserve, John Pennekamp Coral Reef State Park, followed by the Key Largo National Marine Sanctuary in 1975. 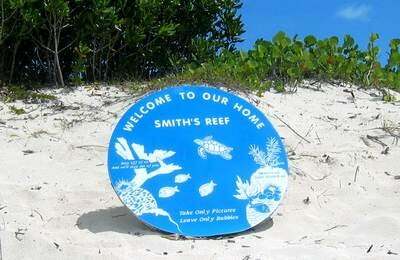 Today, it’s protected by NOAA’s Florida Keys National Marine Sanctuary. 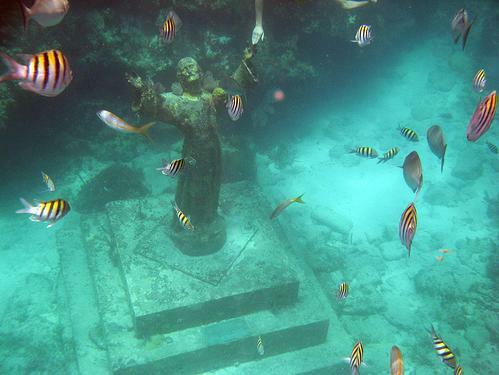 In addition to underwater wildlife like parrotfish and barracuda, snorkelers can check out the Statue of Christ of the Abyss, a large concrete figure in just 25 feet of water tucked between the coral formations of Key Largo Dry Rocks reef. 4. Safaga, Egypt. Located on the coast along the Red Sea, Safaga is only a couple hours by car from Luxor, so you might consider tacking it onto a trip to see the Great Sphinx and the pyramids. Safaga is an especially exotic and relaxing place to snorkel. Not only can you see more than 1,000 species of fish and about 250 species of corals, but the high content of salt in the water helps you easily stay afloat. 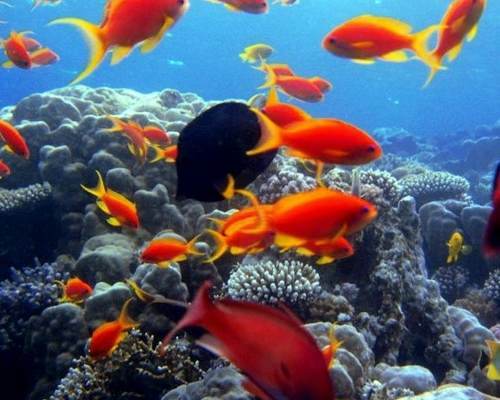 Keep an eye out for clownfish and lionfish, both dramatic in appearnace but common in the Red Sea. (Be careful with lionfish, though. They’re not typically aggressive, but they do have venomous spines on their backs). 5. Turks and Caicos. The government of Turks and Caicos has established several snorkeling trails in the waters surrounding the islands, allowing snorkelers to follow designated paths with coral and marine life. Some of the most popular ones are close to the capital, Providenciales, and include Smith’s Reef, a spot near Turtle Cove that begins just three feet off shore, reaches up to 30 feet in depth, and might afford you glimpses of lobster, stingrays and turtles. Another option, Bight Reef, has a walking trail near Coral Gardens that leads directly to the snorkel path; there are actually signs underwater explaining the different types of coral. Both of these locations are great for beginner snorkelers, but can get crowded and touristy, so as alternatives, try Columbus Landfall Park on Grand Turk or Three Mary Cays on North Caicos. 6. Surin Islands, Thailand. 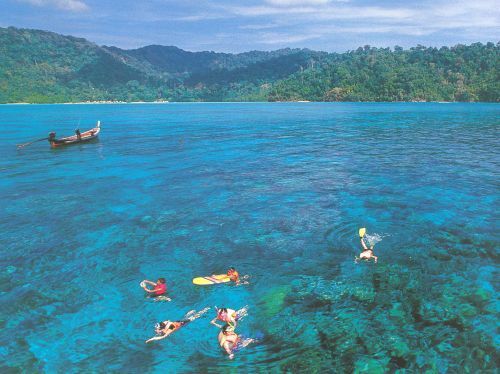 An archipelago of five islands in the Andaman Sea, Surin Islands are just over 30 miles from the Thai southern mainland, west of the Suk Samran district. A National Marine Park created in the 1980s, the archipelago is protected from mass tourism and over-fishing, and its pristine conditions allow snorkelers to see whale sharks, manta rays, sea turtles and napoleon wrasses. About 11 miles east of the islands themselves, in the middle of the open sea, Richelieu Rock is considered one of the most famous dive spots in the world. Its clear, shallow water is ideal for both beginner and advanced snorkelers, offering stunning views of several coral reefs. Since the Surin Islands are uninhabited (meaning no resorts, hotels, etc.) your best bet is to stay on the mainland and book a chartered snorkeling tour. 7. 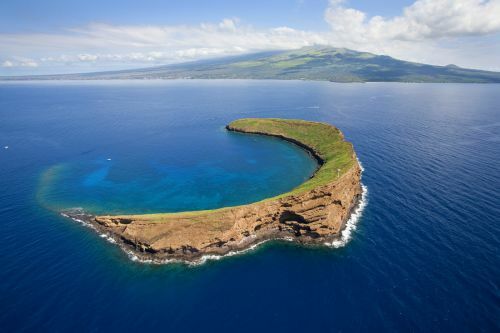 Molokini Crater, Hawaii. Located in Alalakeiki Channel just three miles off the coast of Maui in Hawaii, Molokini is a crescent-shaped, half-submerged volcanic crater islet. Its crescent shape protects from big waves and currents, making it ideal for a relaxing snorkel experience. Water visibility is tremendous here, usually between 100-150 feet, but it can get up to 200 feet on a good day. The water stays unpolluted and clear because the crater was named a Marine Life Conservation District in 1977. It’s a Hawaii State Seabird Sanctuary, as well, so you can easily spot a wedge-tailed shearwater or a bulwer petrel. Molokini’s stunning coral reef is home to over 200 species of fish (surgeon fish, black triggerfish, Moorish idol, moray eels and more), but the big attraction here is the whale shark, which despite its size, isn’t a threat to humans–the species is vegetarian. Keep in mind, this is a popular snorkeling spot, so if you’re looking to be the only ones on a deserted snorkel adventure, this is probably not your pick. 8. Hol Chan Marine Reserve and Shark Ray Alley, Belize. Home to a 185-mile barrier reef–the second largest in the world–makes Belize an exciting place to snorkel. Some of the best spots are part of the Hol Chan and Shark Ray Alley Marine Reserve located approximately four miles southeast of San Pedro near the island of Ambergris Caye. The reserve is separated into four zones, and you can access the zones by boat for a fee. The most popular zones are the A Zone (Hol Chan Cut) and the D Zone (Shark Ray Alley). In the Hol Chan Cut, a beginner snorkeler can see large schools of jacks, groupers, snappers and barracuda extremely close to the surface. More experienced swimmers can swim from one side of the cut to the other to experience the drop-offs on either side. Night snorkeling can be a special experience as this is also a bio-luminescent area, where you can spot glowing green moray eels and parrotfish and sparkling dinoflagellates. In Shark Alley, as one might guess, adrenaline seekers can come face-to-face with nurse sharks and sting rays.